In November 2014, a salvage excavation was conducted southeast of Ligad Center in Modi‘in (Permit No. 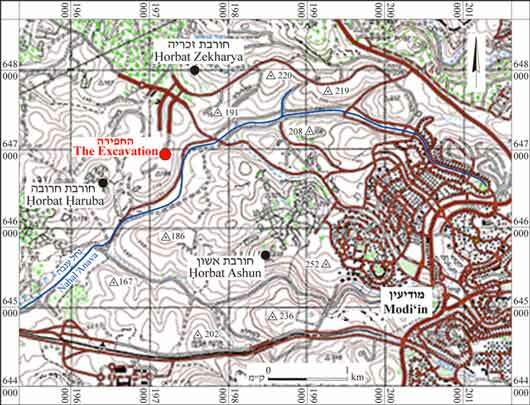 A-7252; map ref. 197283–672/647092–144; Fig. 1), after mechanical equipment exposed ancient remains during a preliminary antiquities inspection. The excavation, undertaken on behalf of the Israel Antiquities Authority and financed by Aviv Paritzki, Esq., was directed by S. Krispin, with the assistance of Y. Amrani (administration), A. Peretz (field photography) and M. Kahan (surveying and drafting) and R. Toueg (preliminary antiquities inspections). 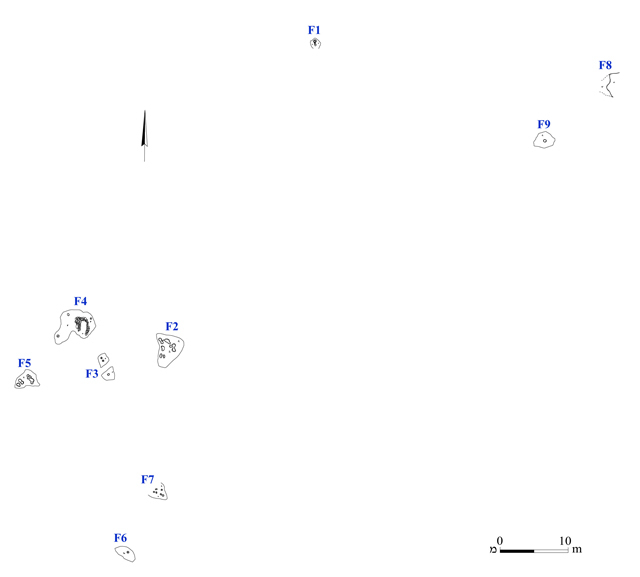 Nine sites (F1–F9; Fig. 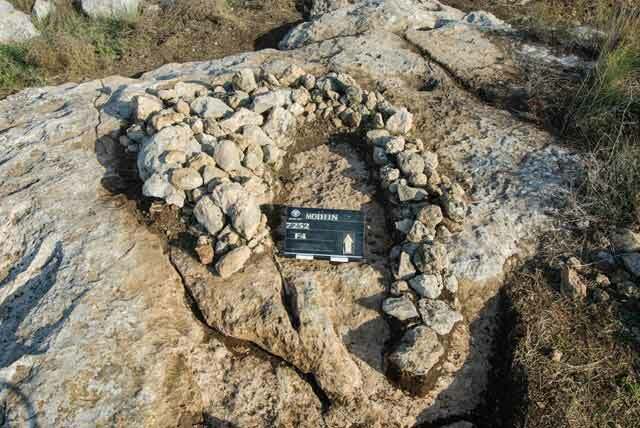 2) identified in the preliminary inspection were excavated. The excavated area extended across a hill characterized by numerous bedrock outcrops spotted with accumulations of alluvium with Mediterranean vegetation. Several ancient settlement sites are located in the vicinity of the excavation, including Horbat Ashun, Horbat Zikhriyya and Horbat Haruba. 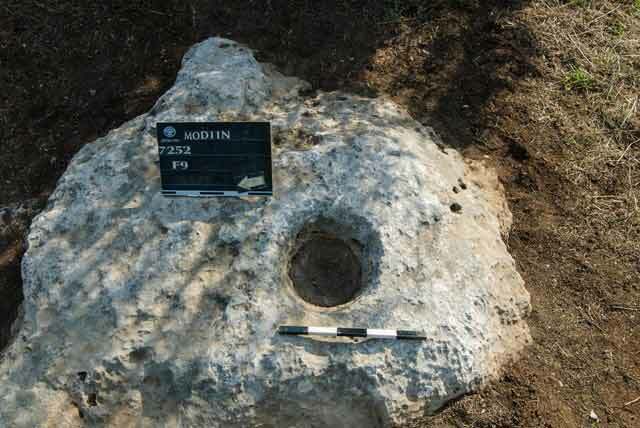 In an excavation conducted in 2012, slightly south of the current excavation, remains of a building, cisterns, winepresses, a rock-hewn installation and a burial cave were discovered, and pottery sherds from the Hellenistic and Roman periods were gathered (Avner and Shabi 2013). An inspection survey performed in 2013 just south of the excavation area, yielded field walls, field towers, subterranean cavities, cisterns, winepresses, cupmarks and agricultural installations were documented, and flint flakes indicative of tool production were collected from the surface. Site F1 comprises a rock-hewn cupmark (diam. c. 0.3 m, depth c. 0.3 m). 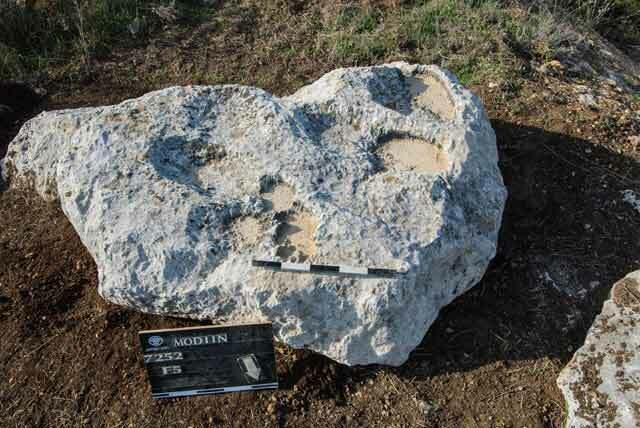 Site F2 comprises a concentration of seven small rock-hewn cupmarks (L125–L131; diam. 0.1–0.2 m, depth c. 0.1 m; Fig. 3). Site F3 comprises three rock-hewn cupmarks (L102–L104; diam. 0.2–0.3 m, depth 0.1–0.2 m; Fig. 3). Site F4 comprises a heap of small and medium-sized fieldstone clearance (L105; diam. c. 2 m, max. height 0.5 m; Figs. 3, 4). Three rock-hewn cupmarks (L106, L107, L124; diam. 0.2–0.3 m, depth 0.1–0.3 m) were noted around the stone heap. Site F5 comprises a cluster of seven rock-hewn cupmarks (L108–L114; diam. 0.1–0.3 m, depth c. 5 cm; Figs. 3, 5). Site F6 comprises a small rock-hewn cupmark (diam. c. 0.2 m, depth c. 5 cm). Site F7 comprises a cluster of six small rock-hewn cupmarks (diam. 0.1–0.2 m, depth 5–10 cm). Site F8 comprises an elliptical underground cavity (width c. 2 m, max. height 1.5 m; Fig. 6), probably natural. 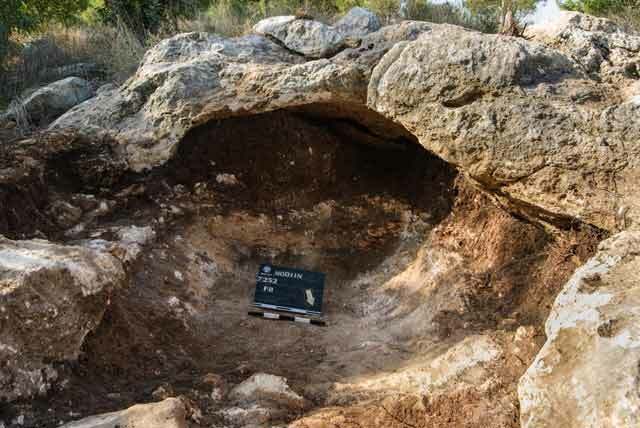 Due to safety concerns only its opening was excavated, yielding pottery sherds and abraded flint flakes. Site F9 comprises a rock-hewn cupmark (diam. c. 0.4 m, depth c. 0.3 m; Fig. 7). A small cut was hewn in the center of the cupmark’s floor. The excavation yielded numerous cupmarks, a stone clearance heap and an underground cavity. Researchers have suggested many possible uses of cupmarks, including collecting rainwater, grinding grain, producing olive oil and mining flint for knapping tools. The most plausible of these interpretations is that cupmarks were used for pounding plant foods. It seems that the excavation area constituted part of the agricultural hinterland of Horbat Haruba, and that the finds are related to the agricultural activity that took place there. Numerous remains indicating agricultural activity were previously discovered in the nearby area. Avner R. and Shabi T. 2013. Modi‘in. HA-ESI 125. 4. Site F4, a stone clearance heap, looking north. 5. Site F5, cupmarks, looking south. 6. Site F8, a natural underground cavity, looking south. 7. Site F9, cupmark, looking east.